My California Club Sandwich recipe is a simple sandwich loaded with fresh ingredients to maximize flavor. Sandwiched inside a soft deli roll and piled high with roasted turkey and Havarti cheese atop a bed of fresh greens, savory bacon, fresh guacamole and tomatoes, this California Club Sandwich will have you dreaming of lunch everyday! We are heading into August already! Can you believe it?! 2017 sure is flying by for me, but I'm excited that August is here, because that means it is National Sandwich Month. It also means I'll be heading back to California soon to visit my daughter and share our travel adventures with you, so I decided to fuse those two occasions together and make this California Club Sandwich recipe inspired by one of our trips to the Golden State. How will you celebrate National Sandwich Month? Leave me a comment to share your favorite sandwich. If you need more sandwich inspiration to get you through National Sandwich Month check out Life Tastes Good's collection of sandwich recipes. Last year, after Madison moved out to California, Don and I wasted no time in visiting her and just as soon as we got there, we started exploring the beautiful Golden State, California. The very first day we got up early and headed out on a tour bus to Yosemite. Along the way, the driver stopped so we could stretch our legs and pick up some snacks to enjoy. We decided it would be fun to pick up sandwiches and have a picnic in Yosemite, so we headed straight to the deli counter and they made us a Santa Cruz Club Sandwich. It was the most delicious sandwich packed full of roasted turkey breast, creamy Havarti cheese, and crispy, warm bacon with fresh avocado, tomatoes, and greens on a super soft and fluffy french roll. It looked so good, we didn't want to wait for the picnic! Ultimately, we decided we would enjoy it more surrounded by the beauty that is Yosemite, so we mustered up all of our self-control and tucked it safely away until later in the day where we enjoyed it along side the view of Yosemite Falls. Definitely worth the wait! I recreated that club sandwich as soon as we returned home from our trip and am finally getting around to sharing it with you. I hope you enjoy this California Club Sandwich as much as we do. Read more about our visit to Yosemite where I share tons of pictures of the beautiful scenery and share our Secret to Seeing Yosemite in a Day. 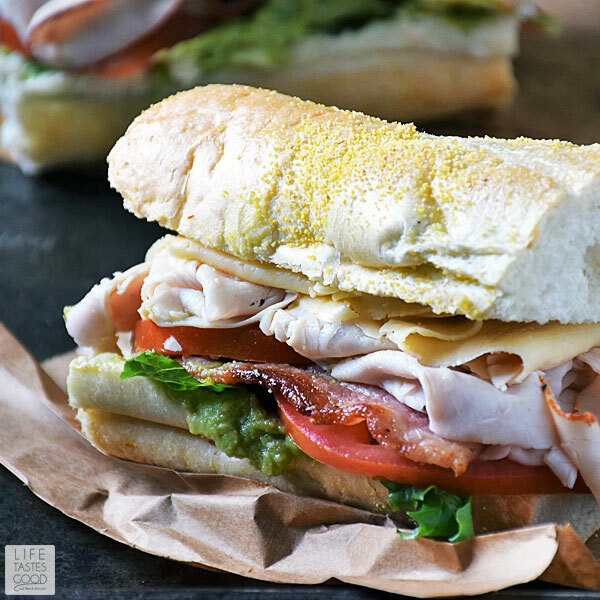 A simple sandwich piled high with roasted turkey, creamy havarti cheese, and crispy bacon atop fresh ingredients like guacamole, tomatoes, & greens to maximize flavor. I purposely left exact measurements out of this recipe, so you can fill the sandwich with the following ingredients in as much or as little as you like. Enjoy! Spread a thin layer of mayonnaise on both sides of the sub roll. 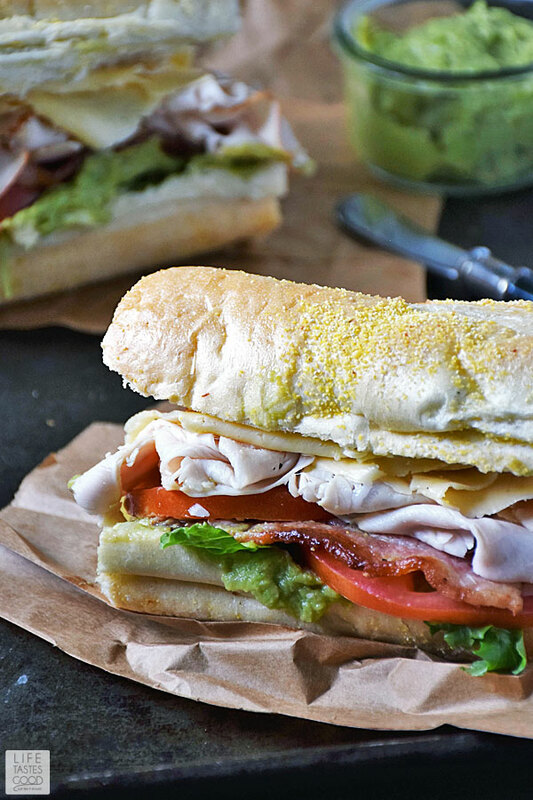 Top with fresh guacamole, bacon slices, tomato slices, roasted turkey breast slices, and havarti cheese. Season with salt and pepper, slice in half, and enjoy! Oh I love this sandwich classic, havarti is one of my favorite cheeses, looks delicious! 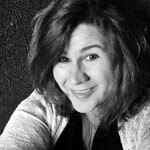 I cannot believe it is August, nor do I want it to be. But California I will take. I have been dying to move there for years and hope I get to do it very soon. Who knew you could make the club sandwich even better?! This sounds amazing! 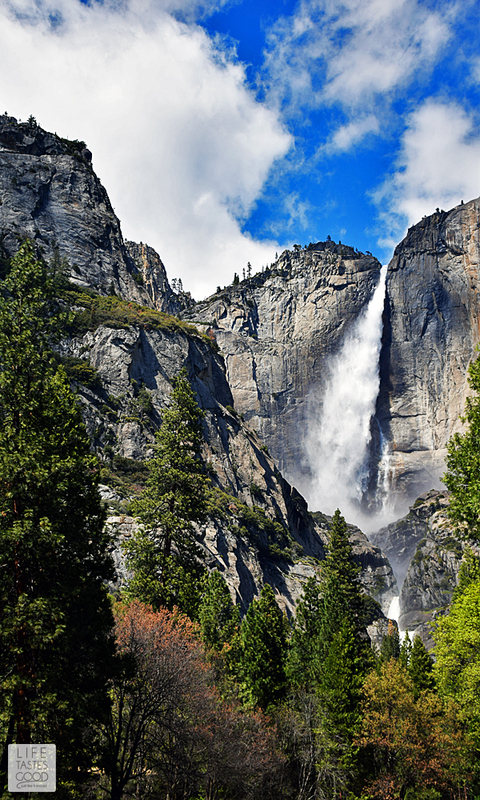 I love Yosemite and your photo of the falls is fabulous! Your daughter has good taste, Marion. Glad you got to explore Yosemite on your CA visit =) As for your sandwich, you had me at havarti cheese! I go to CA at least once a year and have yet to visit Yosemite. It is going on my bucket list along with this amazing sandwich. you had me at bacon... then you added guac. WOW! Quite the sandwich! I always seen clubs as triple decker toasted sandwiches!